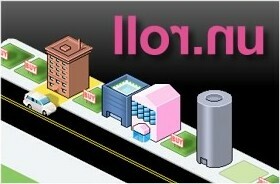 Whatever it's called, llor.nu is an intriguing idea for a new casual Web game that you play for about 10 or 20 minutes a day. The game is played as a simple board game, like Monopoly, by taking turns. The object of the game is to become the player with the highest net worth. As with most board games, you roll a die and move that number of squares. If the square you land on is a buildable square, you may claim it by purchasing a hotel of the size and quality of your choosing. You may take as many turns as you wish, that is until you run out of money. To earn more money you will need to build hotels and then wait for other players to land on them. The bank provides you with a daily allowance, and if that's not enough, you will eventually be able to buy game credits through PayPal. There is a short and relatively painless registration process that requires a valid email address for verification. Just enter your preferred player name, real name, email address and password. Click the link in the email message the game sends you, and you'll be signed-in and playing right away. Based on a previous and similar Web game, Macropoly, this implementation has been designed to use the latest Web technologies for flexibility, compatibility and growth. The game is created by Michael Buffington using Ruby on Rails, and he is also building an API to the game that could support mobile devices, chat bots, and even allow others to create interfaces to it as well. There's a blog for game annoucements, and a forum for feedback and questions. It should be fun to see this game grow. Oh, and make sure you land on one of my hotels, I have special "Welcome" rates in effect. Click. Holy cow, the site is slow. It looks cool, but it looks like the bandwidth is too limited. Of course, it may just be getting hit hard after being blogged here. It's busted now. I got 500 Internal Server Error. It's in beta test, expect errors. And besides, the server is likely getting pounded with new visitors. I, too, received an error during my experience with the game, and yet it was only a speed bump upon an otherwise freshly paved new road. The game name is apparently, roll.un or un.roll backwards. Concept is well done, except for the minor server bumps. But sometimes that's to be expected with the load you put on the server. Really? I seem to be on a street that recently experienced an earthquake... Maybe I'll try it again in a few days once the traffic has died down. Give Michael a little time to work things out, as the site is brand new. I trust he'll have things ironed out soon enough. I doubt it. I have 30. Check the high scores. Just want to try out the spoiler tags. This is not a spoiler. Just testing. Hey, the site doesn't appear to be working at all. I can't even get the main site to come up. I really want to play this game, but haven't gotten a chance to yet. Anyone know whats wrong with it? Well Jay the site says that the game will be back online in a week so you might want to keep checking back. Yep, it's even open-source now. It's boring - needs more special items or something - right now you just roll until you have enough money to purchase more cheap hotels - and hope you don't land on other's cheap hotels. I've been running this game on IE 6.0 and so maybe that was part of the problem, but I found that graphics to be terrible. The tops of all the buildings were cut off, and only showed gray squares instead. The game is very repetative, and very slow. I know the game is still only in beta stage, but it really doesn't seem very exciting or interesting. A large number of players on this game use bots to play for them, making it extremly difficult for the average gamer to get ahead. I really didn't enjoy playing this game. Thanks for all your feedback. It looked interesting when it first started, but based on the negative experiences mentioned above, I have removed the game from the recommended section. cheers. I really wish this game was still around. Maybe it'll make a comeback.